For the perfect wedding setting you'll need to call in the professionals, says newlywed Hetty Lintell. So, you’re engaged! My first advice would be; sit back and drink champagne – now is the time to bask in the attention as the cards, flowers and bubbles flow in. Once things calm down (and if you’re anything like me) panic might ensue, as you realise that actually, planning a wedding is quite the undertaking. Too many opinions (they might call it ‘words of wisdom’) and conflicting families will most certainly add to your stress load, then add Pinterest and Instagram into the mix, showing off picture-perfect weddings, and you’ll need a lie down in a darkened room to recover. Don’t get overwhelmed by the number of things to think about. Instead, keep your cool and start with your first big decision: where should we hold it? After toying with the South of France my now-husband and I opted for the Northamptonshire countryside, much to my parents’ relief – a field in the middle of nowhere, where I’d grown up. The down side? The field had no running water, electricity or rain cover anywhere nearby. Here’s what we wish we’d known before we embarked on the process. We used a company called PapaKata, who specialise in helping set up events in the middle of nowhere. It proved to be a great decision. The key to enjoying your wedding planning is delegation – delegate as much as humanly possible and you’ll reduce your stress – and the Yorkshire-and-Henley-based firm took the strain over the marquee from the word go, right up until the day itself… not least on the day before, when they calmly dealt with the issues caused by a torrential downpour. Check the background and track record of your supplier as well. There is actually a professional body called MUTA for professional marquee companies – all have signed up to a code of practice and offer all the insurance and peace of mind you’ll want. 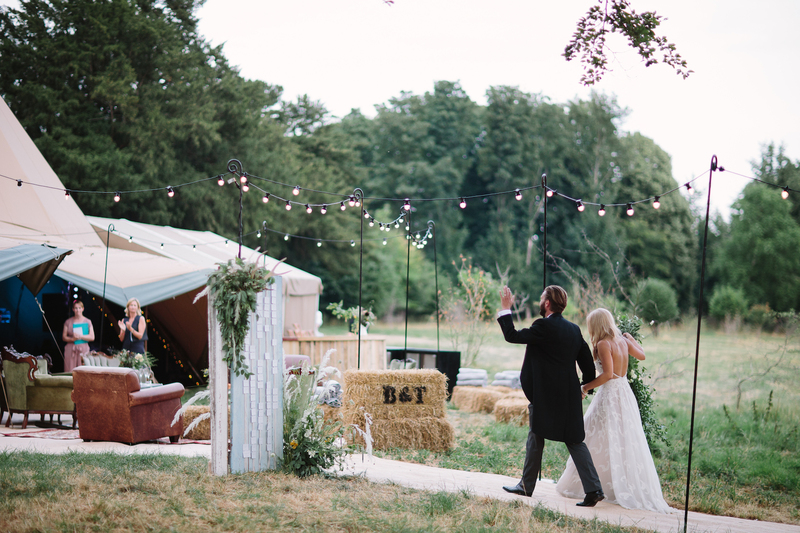 There are all sorts of marquees, tents and teepees out there, so you should hold out for exactly what you want. We didn’t like the idea of a generic white box in our lovely organic countryside setting, so, with 170 people descending upon us, we decided on a Sperry tent – the beautiful, old-fashioned style, made from sail cloth. Our supplier PapaKata came to the field at the start of the process to make sure that the marquee goes in the best spot, with entrances positions and spaces all positioned perfectly. 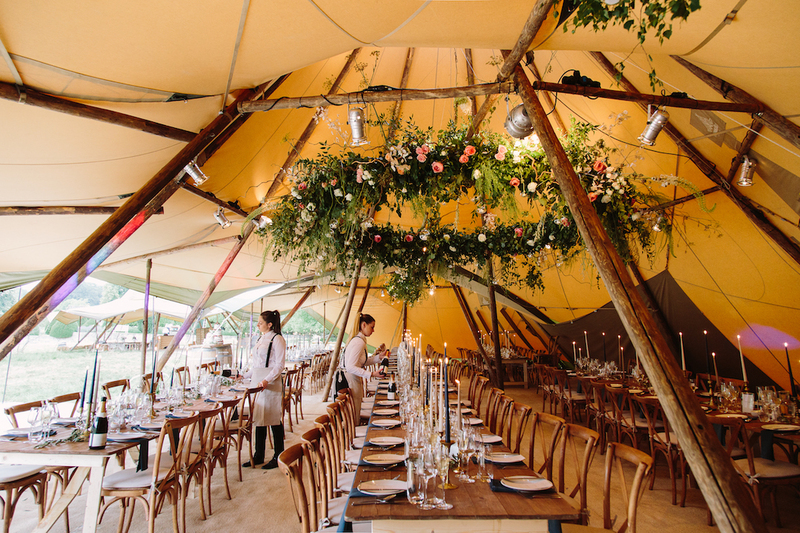 Don’t have preconceptions about where things can or can’t go – many companies use Sperry tents and Teepees that are modular, so you can cater for any number of guests tents can hold and gives you the flexibility to create an event that is bespoke to you in a unique location. Take time to consider the inside as carefully as the structure itself. The careful positioning of your reception bar and dancefloor, for example, can help with the flow of the day. Similarly, decorative items such as floral hoops and giant mirror balls can allow you to incorporate your concept and colour scheme whilst creating zoned areas for dining and dancing. Getting married is, and should be, a very special day. But make sure it's only a day, says Annunicata Elwes. Our columnist reflects on the ups and downs of the typical modern wedding.